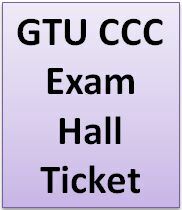 Gujarat Technological University, Ahmedabad has issued Hall Ticket for CCC Exam Phase 6. CCC Exam Hall Tickets is Issued whose Promotion or Higher Scale or Confirmation of Appointmnet is Pending on or before 31-12-2009. You can download Hall Ticket by entering Application number through below link.